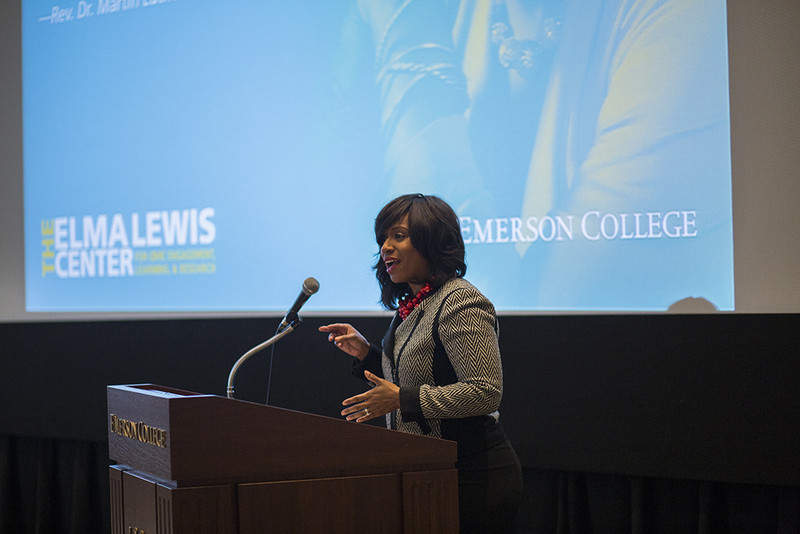 Ayanna Pressley, Boston city councilor-at-large, spoke at the MLK Community Leaders Breakfast at the Bill Bordy Theater. President M. Lee Pelton at the MLK Community Leaders Breakfast. This week, Emerson is celebrating Martin Luther King, Jr. through a film screening, a day of service, a summit on race and difference, and multiple department-hosted conversations on the topic across campus. The theme of the week, Why We Won’t Wait, is a take on Martin Luther King, Jr.’s book of a similar name. Sylvia Spears, vice president for diversity and inclusion, said in an interview that the organizers intended this event to be about action. “There are times when it’s all reflective and celebratory, but there’s hard work to be done,” Spears said. Spears said that the events of the week are in part a response to last year’s student walkouts that asked for increased cultural competency and highlighted racism on campus. She said that the demonstration showed administration that they urgently needed to address these issues. “Every day that we wait has the potential to cause harm,” Spears said. She said that about 25 conversations on race and difference are being hosted throughout the week for students, faculty, and staff. The facilitator guide for these discussions, which was drafted by members of the Office of Diversity and Inclusion, included questions about the ways that privilege and prejudice had influenced minority experiences. Various academic and student support departments are hosting conversations Wednesday through Friday. Robert Amelio, director of diversity and inclusive excellence, wrote in an email that there were too many open conversations scheduled, and they consequently had low attendance. On Tuesday, the film Hate Crimes in the Heartland was screened in the Bright Family Screening Room. It was attended by about 12 people, and examined race relations through the lens of the 1921 Tulsa, Oklahoma, race riot and the 2012 Good Friday Murders. Following the screening, there was a panel discussion with Rachel Lyon, the film’s director, producer, and writer; Bavand Karim, its writer and cinematographer, and an Emerson visual and media arts assistant professor; and Kevin Peterson, founder and executive director of the New Democracy Coalition. The talk, which was facilitated by Amelio, centered around the concept of hate crimes. Lyon said at the event that it was the media’s duty to “shine a light” on injustices, but acknowledged the way that some outlets sensationalized or exploited crimes for profit. The third annual Rev. Dr. Martin Luther King, Jr. Day of Service is scheduled for Friday. It features community service opportunities through various nonprofit groups. Spears emphasized that humility, respect, and attention to the actual needs of a community distinguish service from charity. The week is set to wrap up on Friday afternoon with a summit on race and difference in the Bill Bordy Theater, where participants will address the discussions and plan for the future. “We have to think of these events … in the context of a larger strategy for creating change,” Spears said.